Keep Your Produce Fresh up to 30 Days! Debbie Meyer's Green Boxes help keep produce fresh for up to 30 days and reduce vitamin loss by up to 50 percent. Each set comes with 16 containers and 16 lids. Debbie Meyer's Green Bags have been around for years and are now a staple in many households to prolong the life of produce. We are happy to introduce Debbie Meyer's Green Boxes. You get the same technology from the Green Bags but now in containers as well. 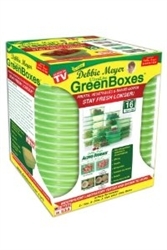 The Debbie Meyer's GreenBoxes make storing your produce even easier while lasting longer than using ordinary containers. They are stackable and nestable for easy storage in your refrigerator. Microwave and dishwasher safe, BPA free, made in the USA! Comes as a 32 piece set.